This article will describe how to connect your Infusionsoft account to Interact apps. Step 1: In the Interact app builder, under "Connect your email list", choose Infusionsoft from the list of integrations. Step 2: Enter your Infusionsoft credentials and click Log In. 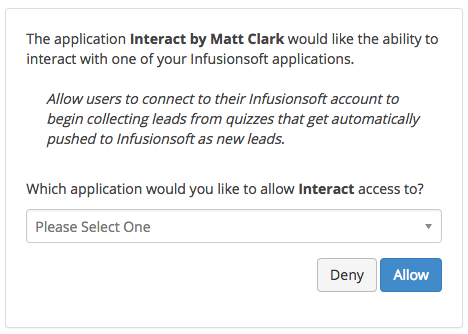 Step 3: You will be prompted to choose which Infusionsoft application you would like to connect. Choose the one you would like to connect from the dropdown and click Allow to finish. Run Action Set: Choose an Infusionsoft action set from the dropdown to run on new contacts. Example: For a quiz answer trigger, you could connect different action sets to different answers to run specific action sets depending on what a quiz taker answers in your quiz. Update Custom Field: Choose an Infusionsoft custom field from the dropdown to update the custom field for new contacts with a specific value. The value will auto-populate with the trigger name, but you can customize this with any value you want. Example: For a quiz result trigger, you could choose the Infusionsoft custom field "Quiz Result Title" from the dropdown and populate the field with the quiz result title for your quiz. Add Tag to Contact: Choose either to add a tag to the contact with a default value or with a custom value that you provide by selecting from the dropdown. Step 3: Once finished with one trigger, you can select a different trigger from the left sidebar. When you have set all triggers that you need for your specific setup, be sure to click Save & Continue. Step 1: Here you will find an overview of the way your opt-in form fields are connected to Infusionsoft custom fields. Default fields (cannot be changed): Email, First Name, Last Name, Company, Phone Number, Zip Code. Step 2: For all other fields, choose one custom field from the dropdown that you would like to populate with the form value. Example: mapping Company Name to "Custom Field 1" will populate the value inputted for Company Name into the Infusionsoft custom field "Custom Field 1"
Step 3: When finished with mapping your form fields, be sure to click Save & Continue. If you find you need to make changes, you may edit the integration settings at any time. IMPORTANT: If your quiz is already published and embedded, any changes made to the integrations will require you to publish your quiz after changes have been saved. Will existing Infusionsoft contacts be updated? Yes, existing Infusionsoft contacts will be updated with updated field values, tags, and be added to new action sets. How do you create new Infusionsoft custom fields? Step 1: In your Infusionsoft account, navigate to Admin -> Settings. Step 2: Under Custom Fields section, ensure Set up custom fields for is set to Contact, and click Go. Step 3: Ensure the dropdown is set to Field, then click Add. Step 4: Enter a value for the name of the custom field, ensure that the Type is set to Text, then click Save this Field. How do contact tags get created in Infusionsoft? All tags get created in Infusionsoft "on-the-fly". This means that every time a quiz taker takes your quiz (or contact information is submitted via the Test Integration step) our system checks all applicable tags to add to a contact based on their answers and results. For each tag value we check if that tag has been created or not in Infusionsoft, and, if not, we create the tag in Infusionsoft with the specified value. If the tag has already been created in Infusionsoft, nothing is created in Infusionsoft. So in order for all tags to be created in Infusionsoft, all quiz results and answers must be either selected by a quiz taker (or chosen via the Test Integration opt-in form). What will a contact tag look like in Infusionsoft? What will custom fields look like in Infusionsoft?